First Prize Jordan, under jockey G.R. Carter, Jr., gets his second stakes win of the season at Remington Park on Saturday's race card. OKLAHOMA CITY, OK�APRIL 6, 2013�The second start of the season in a second consecutive stakes race for older Oklahoma-breds produced an identical result for Fast Prize Jordan, a visit to the winner�s circle. 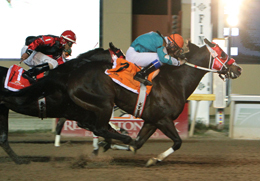 After the Remington Park Futurity trials had been conducted, the 4-year-old horse grabbed the lead in the $53,750 Mr Jet Moore Stakes and held on to win by a neck. Owned by Weetona Stanley and William Smith of Madill, Okla., Fast Prize Jordan is trained by Brian Muse and was ridden by G.R. Carter. Away from the gate in good order, Fast Prize Jordan took the advantage then held off a late charge by Wagons West to get the 350 yards in :17.465 seconds. Priceless Feature, the beaten 4-5 wagering favorite was third after a sluggish beginning. At 2-1 in the betting, Fast Prize Jordan paid $6.40 to win, $3 to place and $2.60 to show. Wagons West paid $4.20 to place and $2.60 to show. Priceless Feature paid $2.40 to show. The Mr Jet Moore Stakes is now added to Fast Prize Jordan�s early season success in the Mighty Deck Three Handicap on March 10. Bred in Oklahoma by the owners, Fast Prize Jordan is by PYC PAINT YOUR WAGON from the Mr Jess Perry mare Fast Prize Doll. The Mr Jet Moore Stakes was his sixth career win from 11 attempts and his fourth victory at Remington Park. The winner�s share of $31,750 moves his total bankroll to $169,041. The Mr Jet Moore Stakes is named in honor of the 1972 American Quarter Horse Association World Champion who was bred in Oklahoma by the late Bob Moore of Norman. Mr Jet Moore was the winner of the very first Champion of Champions, the prestigious race for older horses held every December at Los Alamitos Race Course in southern California. Alfredo Gomez conditions Wagons West, also by PYC PAINT YOUR WAGON, for owner Wade Helton. Willow Ridge Farms and Cathi Carroll bred the brown colt from the First Down Dash mare De Elegant Dash. Omar Ryes was aboard. Heavy favorite Priceless Feature picked up $6,307 to boost his career total more than $381,000. Eddie D. Willis trains gelding for Ed Melzer. Jimmy Brooks was aboard the Sam Green Oklahoma bred. Completing the field were Painted Lies, Katillac Man and Arbeka Raincloud. Blazen Getaway, Colby Cartel and Send Me A Candy Tree were scratched.